What makes each of these stocks so attractive is that they tie into what our Chief Investment Strategist Keith Fitz-Gerald calls an "Unstoppable Trend." A controversial but profitable one of these trends is "war." War is ugly, but in today's world it's a fact of life. Given our current political climate and the state of conflicts already underway across the globe, it is an undeniable fact of life. The good news is that all three of our top defense stocks focus on calming the worst conflicts and even preventing further destruction. And we'll share these stocks with you in just a moment. If investing in war is a conscience issue for you, set that aside for one moment and consider a couple of key facts. For one, military spending as an industry has now reached almost $2 trillion annually. This equates to about $250 for every person on the planet. The United States accounts for 37% of the world's total military spending, according to figures from the Stockholm International Peace Research Institute. To reach this level, you'd have to combine the spending of China, Saudi Arabia, Russia, the UK, India, France, and Japan – the next largest spenders. Fitz-Gerald makes several important points about war and why it's an Unstoppable Trend. Chief among them are that war and defense spending are tied to natural resources, which has become a primary global issue today. Another is that, as our chance of conflict increases, the nature of war changes. What we think of as "war" today could be a very different occurrence in the future. That means that countries will always want the latest and greatest military technology and equipment. Best Defense Stocks to Buy Now No. 3: Lockheed Martin Corp.
Lockheed Martin Corp. (NYSE: LMT) is one of the world's top defense companies, and the stock has strong long-term potential. The company is a partner in the lucrative F-35 market, where it will produce as many as 3,100 of the jets by 2035. Last year, Lockheed purchased Sikorsky Aircraft, the helicopter producer, for $9 billion, which is already bringing it a return on its investment. Lockheed's Sikorsky division is currently working on an advanced landing technology called Aerial Reconfigurable Embedded Systems (ARES). The program has been underwritten by the government's Defense Advanced Research Projects Agency (DARPA) and will be worth a fortune in new contracts once off the ground. Just this week, the U.S. Air Force awarded Lockheed a $67 million contract. Lockheed will provide spares for the Royal Saudi Air Force's F-15 sensor suite. LMT's most recently quarterly earnings (Q3) were $11.6 billion. LMT is trading at $251.61 with shares up 16% YTD. The company's annualized dividend payout is $7.28 with a 2.89% yield. The mean target price for LMT stock is $273 per share, per FactSet, with about half rating the stock as a "Buy." Best Defense Stocks to Buy Now No. 2: Raytheon Co. If you want to buy defense stocks, you can't go wrong with defense giant Raytheon Co. (NYSE: RTN). Raytheon is a commercial and government contractor that specializes in defense, security, and electronics. Raytheon's top segments, which are Missile Systems (MS) and Integrated Defense Systems (IDS), bring in revenue of over $20 billion each year. In Q3, Raytheon's IDS segment won a $265 million contract with a U.S. ally for its Patriot Air and Missile Defense Systems. IDS also has a new $94 million contract with the U.S. Navy to produce a radar program. In just the past week, Raytheon has been awarded a $9 million contract with DARPA to work on systems to prevent cyberattacks against the nation's power grid. The company also received a $25 million contract from the U.S. Air Force for its Griffin A Block/III missiles. Raytheon does a lot of work outside the United States as well. It's currently in talks with Poland over a potential $5 billion missile defense contract. Raytheon also profits from military spending in Israel, which has had a boost thanks to a recent $38 billion pledge from the Obama administration. According to FactSet, a majority of analysts (74%) rate Raytheon stock as a "Buy." RTN is trading at $143.26 per share. RTN's average target price is $159 per share, and its dividend yield is 1.98%. Best Defense Stocks to Buy Now No. 1: Northrup Grumman Corp.
Northrup Grumman Corp. (NYSE: NOC) is one of the best defense stocks that you can buy today. The company is a leader in both cybersecurity and aircraft measures for our country's military and intelligence services. Northrup recently landed the largest military contract in history for its next-gen long-range bomber, the B-21 Raider. Each plane could cost as much as $550 million, and the Department of Defense wants 80 to 100 of them, which equates to a $55 billion to $80 billion deal. Northrup is also a leader in drone production. The company has just revealed a "tailsitter" drone that can land on small deck ships, effectively turning them into aircraft carriers. These air systems can be used for surveillance as well as weapons delivery. Northrup's Aerospace Systems division is working with Lockheed on systems for the F-35 program, which has helped contribute to a 16.7% boost in third-quarter profits. Northrup's revenue in 2015 was $10 billion, and the company has already passed its mean target price of $245 per share for 2016. NOC is currently trading at $245.99, with shares up 30.19% YTD. NOC also pays a healthy dividend of $3.60 per year with a current yield of 1.46%. 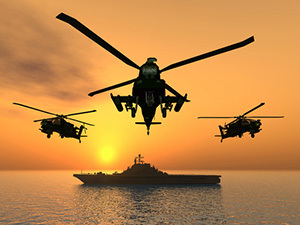 As the investments in defence is escalating globally, there is little doubt that investing in defence stocks is the thing to do in the years to come, if you want your wealth to increase drastically. On the same time, this increased global spending makes WW III creeping closer, and closer.